Mer du Nord Cotes de Belgique et de Hollande (Entre la Frontiere Francaise et Hoek van Holland). 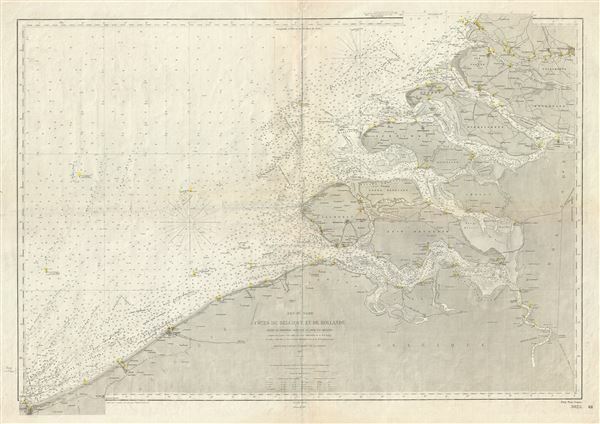 This is a rare and beautiful nautical chart or map of Holland and Belgium issued in 1887 by the Depot de la Marine. It covers the coast of Holland and Belgium from Dunkirk on the French border to Hoek van Holland. The chart offers extraordinary detail both inland and at sea. In the harbor there are countless depth soundings in meters, references to lights and undersea features such as banks and shoals. Inland there is a wealth of information regarding important cities, canals, roads and topography. This map was originally prepared by the French Depot des Cartes et Plans de la Marine in 1872, the present having been updated by subsequent surveys and corrections to 1887. Good. Minor wear and toning with verso repair along original fold lines. Blank on verso. Minor spotting here and there. Few pencil marks in lower left quadrant near border.